The Financial Crisis of 2008 was a global financial crisis that is the worst the world has seen since 1933 with the Great Depression. Drastic measures to confront seemingly insurmountable financial calamity resulted in the creation of TARP (Troubled Assets Relief Program), $700 billion safety net appropriated by the U.S. Congress. The National Bureau of Economic Research has identified the peak of the last boom cycle in December 2007; the U.S. economy has been in decline ever since. The crisis has caused the Recession of 2008, which reached bottom in summer 2009, causing a worldwide economic decline that is the most severe since the 1930s. As of 2013, there are still 4 million fewer jobs in the U.S. than in 2008 - despite $5 trillion in federal stimulus spending. The International Monetary Fund (IMF) calculated that the global financial crisis would produce $3.4 trillion in losses for financial institutions around the world by 2010. World GDP in 2007 was approximately $70 trillion, so the immediate decline in the economic output of the planet was about 5%. Negative economic news spread outward from financial institutions connected to Fannie Mae and the real estate boom to depress housing sales, construction, commercial real estate, automobiles, retail sales, state and local government, and virtually every other sector of the economy. Consumer confidence and spending plunged. Major banks and corporations went bankrupt. The recession was worldwide. Initially governments across the world borrowed and spent huge sums of money to reverse the crisis, but the results were anaemic and the decline continued. By 2013, the notion of a Keynesian stimulus had been abandoned by the European Union, which cut it's budget in real terms, and the United States which invoked a sequestration of federal mandated spending to reduce the baseline for future years. While the prospect of deflation ordinarily would be real, the Federal Reserve had vastly increased the money supply both domestically and abroad with lending to foreign Central banks. Although the U.S. monetary base aggregates were four times larger than in mid 2007, federal spending was 50% more than in 2008, and the accumulated national debt one-third greater, U.S. GDP output still lagged and the workforce was the size (134 million workers) as it was in 2003 - despite population having grown by 24 million people. The U.S. government provided cash bailouts of several hundred billion dollars and long-term loan guarantees of over $7 trillion (compared to a GDP of $14.6 trillion in 2008). Unlike crises in the mid 1970s and early 1980s, the panic began in the financial and real estate sector with devastating effects on many very large financial companies worldwide, especially in September 2008. The negative effects by October 2008 began spreading to all other sectors of the economy, and forecasts for the next several years showed little likelihood of recovery anywhere. For the effects on the broader economy (outside of finance and autos) see Recession of 2008. The crisis originated with government-backed home loan guarantees in the United States, and has impacted every country in the world. Banks and financial companies reported losses of over one trillion dollars; investors suffered "paper losses" of many trillions. U.S. stocks went down 50% from their peak in 2007. Paper losses for owners of stock in major financial institution were over 70%, and owners of some have lost 99% as major banks closed down. The stock market declined 50-70% in major countries and pension funds have large paper losses. Paper losses in real estate have been in the trillions; the average price of American houses fell 20%, with 30% and higher declines in California and Florida. However, thus far ordinary depositors with cash in the bank have suffered no losses. Owners of stocks in the 5000 largest U.S. corporations have paper losses of $10 trillion in 2008, dropping to $10 trillion in October from $20 trillion in late 2007. In late September the crisis focused on liquidity—financial companies owned hundreds of billions of dollars of "toxic" real estate assets, mostly based on U.S. Fannie Mae-backed mortgages; they could not sell the toxic securities because no one knew how much they were worth, and large scale loans between major institutions stopped flowing as the system lost liquidity and froze up. A $800 billion rescue plan became law in the U.S. October 3. Meanwhile, Europe's sovereign debt crisis continued to deteriorate, as trillions of dollars in losses accumulated there and in many other countries. International agencies such as the International Monetary Fund are giving guidance for medium-sized countries, like Pakistan and Ukraine. In the panic, people around the world sent their money to the U.S. and Japan because the banks there are more tightly regulated and considered safer than their own banks. The price of oil, which reached $145 a barrel in the summer, plunged to under $50. That plunge eased pump prices, helped commuters, and the airline industry. Both parties have expressed anger at the crisis, and have promised extensive new regulations of the financial industry. The Republicans opposed additional bailout aid to General Motors, which was on the verge of bankruptcy. Democratic Congressional leaders and President Barack Obama had the United States Treasury take control of General Motors while paying existing shareholders 22 cents on the dollar for their investment and claims, and not demanding any meaningful concessions from the labor unions to bring wages more in line with a competitive world standard. The Bush administration undertook a program in which it took control of several of the largest financial institutions and government sponsored entities (Fannie Mae, Freddie Mac, and AIG insurance) at the heart of the crisis, forced mergers of others, purchased $125 billion of ownership in the 9 largest banks in the U.S., and provided relief to the largest bank, Citigroup. Until October the crisis had little impact on the non-financial sectors of the world economy, but then negative impacts started appearing. Companies could not borrow money for expansion or in some cases for routine operations, and had to cut back. Consumer spending fell and unemployment rose sharply. By Election day in November pessimistic reports were coming in daily from practically every sector of the American economy. There were no bright spots, and with tax revenues down, state governments began large-scale cutbacks, especially in New York and California. By late October it appeared the financial crisis was causing a slowdown of all the economies of the world, and a serious recession with widespread unemployment and business failures The Federal Reserve took aggressive steps to dissolve the liquidity freeze and to allow lending to flow again. As hundreds of billions of dollars poured into the U.S. from abroad, financiers looked for imaginative ways to make a profit. They turned to real estate, with the philosophy "Buy high--sell higher!" The higher price paid for a house the more profit would be made when it was resold ("flipped") in six or 12 months; prices were certain to keep going up and up. Salesmen made big money by phoning prospective buyers, promising to get them Bog Money Quick. People who owned a house whose value had doubled could and did refinance their mortgage for the higher amount, and keep the difference. In the early 2000s, U.S. interest rates were low and demand for housing was high, as housing prices soared, especially in California, Florida, Nevada and Arizona. Mortgage companies and banks were very eager to lend, especially to people with mediocre credit who would not previously have been eligible for mortgages and to speculators. Speculators were ordinary people who already had a house and who were hoping to make a large profit on the purchase and quick resale ("flip") of another house or condominium, which no one ever lived in. The expectation was that continuously rising house prices would cover the mortgage payments through refinancing. Many of the mortgages involved very low down payments and low monthly payments for the first year or two, after which the payments would start soaring. Sometimes the monthly payment at first was zero. Both the Bush and Clinton administrations made it a national priority to encourage more people to buy houses, assuming this social engineering would be good for everyone. In 2000 Howard Husock warned that the Community Reinvestment Act of 1977 and its expansion in 1995 would prove expensive; but President Bush strongly endorsed the program. Despite widespread misunderstanding they did not cause the great crisis since CRA loans to poor neighborhoods comprised only about 6% of the toxic mortgages. "Option adjustable rate mortgages" (nicknamed "Pick-A-Pay") allowed borrowers to vary their monthly payments; they could be so so small they did not cover their interest charges. That meant the total principal grows over time, compared to normal mortgages where the debt owed shrinks over 30 years to zero and the borrower owns the house free and clear. By 2008 banks sold these dangerous "option adjustable rate" mortgages to two million customers. They made sense if and only if the price of houses kept going up and the borrower could sell it in a year ot two at a huge profit. But if house prices declined, the borrower could stop paying and the bank was left with the loss. The NYTimes says Senator Charles Schumer D-NY, is the most responsible for Wall Street's collapse. Schumer as a member of the Banking and Finance Committees, led efforts to regulate credit-rating agencies, shield financial institutions from government oversight and tougher regulations, and saved key industry players billions of dollars in taxes and fees. Americans owed some $10 trillion on their mortgages, most of which were sound with payments made on time. However financiers bundled the mortgages into very complicated packages called "collateralized debt obligations' or CDOs. Hundreds of billions of dollars worth of CDO's were sold to banks, pension funds and financiers in the U.S. and Europe. Generally they borrowed cash to buy the CDOs. The risk was that if the CDO's declined in value, they would not be able to repay those loans. The CDOs were especially attractive because they were not regulated by the government; experts are not sure how many trillions of dollars are involved. Many mortgages were held or originated by mortgage companies like Countrywide and Washington Mutual, as well as investment banks such as Bear Stearns, Merrill Lynch, Lehman Brothers, Morgan Stanley and Goldman Sachs, as well as commercial banking chains like Wachovia and Bank of America, which have thousands of local offices. The speculative real-estate bubble went far beyond residential homes, it infected as well all kinds of commercial real estate, such as office buildings, shopping centers, apartment complexes, hotels, casinos and even empty lots. People bought high expecting to sell higher, and were stunned when the market collapsed. People who loaned money to real estate firms were confident of a 20% return, but more likely lost 25%. The value of office buildings plunged 43% after the peak in Nov. 2007. Most investors who bought in 2007 probably lost all their investment. For example, in 2006 at the top of the market Tishman Speyer Properties and BlackRock Realty invested $5.4 billion to buy the largest apartment complex in the United States, in downtown New York City. Stuyvesant Town and Peter Cooper Village, with 110 buildings and 11,227 apartments housing median income families. The plan was to spend billions in upgrades, and as tenants moved out, to raise the rents. The expectation proved wildly overoptimistic, and the monthly rents collected did not cover the debt payments. In January 2010 Tishman Speyer and BlackRock turned over the property to creditors, taking a 100% loss. Another key contributing factor to the credit market meltdown was the misuse of Credit Default Swaps, or CDSs, which are contracts between entities designed to mitigate against risk of a credit default. A CDS is essentially an insurance policy designed to protect the insured party against excessive losses in a separate financial transaction. However, by structuring the contract as a derivative swap instead of a traditional insurance policy, companies other than regulated insurers could offer them. This created two critical risk exposures to the insured companies, and collectively to the overall market. First, traditional insurers are required to maintain a sufficient level of capital reserves to pay on losses, while companies issuing CDSs were not. Since investments in pooled mortgages were viewed as unlikely to devalue or fail, major issuers of CDSs like AIG and Lehman Brothers found themselves over-exposed to losses. The second risk was that CDSs issued by one firm were typically hedged, or backed up financially, by CDSs with other companies. The strategy of minimizing risk by dividing it into collections of smaller exposures with other companies is a sound practice, but when the original risk is overexposed that overexposure is then spread across the companies that participate in the secondary risk markets. AIG, the world's largest insurance company, was a major player in the financial crisis because it sold $441 billion in unhedged and undercapitalized insurance on securitized debt, much of it tied to mortgage values. Normally an insurance company "lays off" some of the risk by taking out insurance with another company. AIG neglected to do this because it never expected the securities to turn toxic, which they did. Either someone paid the insurance or the nation's financial system would colapse, so the government stepped in, seized AIG, and paid the insurance. The effect of these risks manifested themselves in two key ways. First, when major players in the CDS market like Bear Sterns and AIG were found to be insolvent, or failed outright like Lehman Brothers, the default conditions that were tied to the risk-spreading CDS's were triggered, and many companies found themselves obligated to pay out on contracts they never expected to. These sudden exposures led to capital and liquidity shortages at scores of firms involved in the secondary credit markets, and the default pattern started repeating on itself in an echo-like manner. Since the complex, interdependent nature of the CDS market made it difficult for firms to assess their true exposure to loss in this unprecedented market, they refrained from both short-term and long-term lending to guard against further losses. This essentially led to a freezing up of credit in the marketplace, as lenders refusing to give credit to other lenders translated into businesses and consumers being unable to get short-term operating loans to meet payroll, or borrow for homes, autos, student loans, or credit-card accounts as before. This freezing of the markets to avoid loss was the primary incentive for the U.S. government's Troubled Asset Relief Program (TARP), which injected billions of dollars of government-backed funds into the credit markets to restore confidence and liquidity. The housing "bubble" burst in 2006-07, as prices plunged downward in the Sunbelt. Many speculators and homeowners could not meet their payments, especially those who had "sub-prime" mortgages because their income was too low to support the eventual monthly payments, or who had adjustable rate mortgages where the monthly payments started small then escalated. Foreclosures skyrocketed. With housing prices falling few people risked buying a new house (because it would soon be worth less than they paid for it). Construction firms had built millions of new houses that could not be sold but which glutted the market. By late 2008 half the home sales in the U.S. were by banks selling houses they had foreclosed on at low prices. The problem was that no one could figure out what CDOs were now worth, so very few were willing to buy them. One major investment bank, Merrill Lynch, sold its CDOs for 22 cents on the dollar—a "fire sale" price that was less than they were worth in the long run, because in the long run the great majority of people will make their scheduled mortgage payments. Multiple crises started pulling down major financial players. Countrywide, which originated 20% of all American mortgages in 2006, collapsed and was bought up by Bank of America. Bear Stearns, a large investment bank, went under; the government arranged a sale to JPMorgan Chase; stock holders lost about 90% of their investment, and the confidence in other banks was undermined. On September 7, 2008, the government took control of the two largest mortgage holders, "Fannie Mae" and "Freddie Mac." The two had lost $15 billion on the $5.4 trillion in mortgages they owned, and their notes were widely held in China and many other countries. The fear was that if the Treasury did not act the world's confidence in the US financial system would collapse. However the rest of the world was in trouble too. The stock markets in China and Russia plunged 50%, and the British Treasury had to take over its largest mortgage company, Northern Rock. Vast sums of money flowed into the US because it was safer there than anywhere else. Panic in Wall Street, Sept. 2008; the "bull" is the symbol of optimism on Wall Street and the "bear" is the symbol of pessimism. 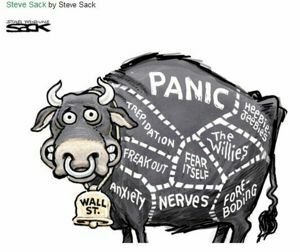 Here the bull panics. By September the major banks were no longer lending money and most reported huge losses as they wrote down the value of the CDOs and other assets. Short sellers sold large amounts of stock in threatened companies, causing further panic and driving down share prices. Lehman Brothers, one of the oldest and largest banks in New York, went bankrupt on Sept. 15 with no one to rescue it. The collapse of Lehman with its $639 billion in assets had a multiplier effect worldwide, severely weakening other big banks and sharply increasing the level of fear and distrust inside the system that caused bankers to sharply reduce their lending. Many large firms and hedge funds had borrowed billions of dollars from lenders and had pledged assets they owned as collateral. When the value of their collateral plummeted, the lenders demanded more collateral to make up the difference, so the borrowers had to sell assets to raise emergency cash. The price of the assets they sold was falling, and large additional sales further depressed prices, creating a downward spiral. Merrill Lynch was sold to Bank of America for $50 billion, about half its value a few months before. Investors realized that AIG could no longer honor the insurance policies it wrote. It lost $13 billion in the first half of 2008 and its shares fell 95% in value. AIG was "too big" to be allowed to fail, so it was given an $85 billion loan from the government; in return the government received 80% of its stock. The government had to add another $38 billion to the AIG rescue in October. In effect AIG, along with GSE (government-sponsored enterprises) Fanny Mae and Freddy Mac were nationalized. The Federal Reserve, with $800 billion in assets, was assisted by the Treasury, which gave it more funds. Heavy borrowing by European banks meant the crisis immediately affected Britain and other countries as well, as the British housing bubble burst about the same time as the U.S. The British government had to take over major mortgage lenders, including Northern Rock in February, 2008. Northern Rock's loans (£25 billion) and guarantees (£30 billion) extended by the Bank of England, together with the value of the company's mortgages (£55 billion), or £100 billion in all, were added to the British national debt. Bradford & Bingley, half the size of Northern Rock, held £40 billion in toxic mortgages, and was nationalized in late September. In late September, the Fortis bank, the world's 20th largest business, was partially nationalized by three governments who injected $16 billion in emergency funds. In 2007 Fortis borrowed heavily for its $100 billion takeover of rival bank ABN Amro; the deal came at the market's peak, and Fortis now cannot pay its debts. The Belgian, Dutch and Luxembourg governments tried to inject capital but as consumer confidence plunged, Netherlands nationalized the Dutch wing of the company and the rest was sold in early October to the French bank BNP Paribas for €14.5 billion euros ($19 billion). In Germany Hypo Real Estate was given €50 billion euros ($68 billion) bailout by the government. The government of Iceland took over its large banks, as the entire island economy verged on bankruptcy because it depended so much on large foreign loans. Most of the European countries hurriedly announced guarantees of personal bank deposits to avert further drop in consumer confidence and runs on the banks. Stock markets around the world continue to decline as pessimism worsens. The European Central Bank aggressively lent money to banks trying to ensure that banks would have adequate cash. The moves have not reassured savers or investors, and European stock markets have fallen even further than the American stock markets, as have the stock markets in China and Russia. On October 13, France, Germany, Spain, the Netherlands and Austria committed €1.3 trillion euros ($1.8 trillion) to guarantee bank loans and take stakes in banks, in an emergency effort to head off the collapse of their financial systems. On October 13, Britain announced it would spend £50 billion ($85 billion) to nationalize two of the five largest banks, HBOS (Halifax Bank of Scotland) and RBS (Royal Bank of Scotland), while taking partial ownership of a third, Lloyds TSB. A fourth, Barclays will remain private if it can raise an additional £7 billion. The fifth, HSBC is based in Hong Kong and will remain private. In October 2008, the Swiss central bank and the big UBS bank reached an agreement to transfer as much as $60 billion of troubled securities and other assets from UBS's to a separate entity. UBS will put up $6 billion in equity. The Swiss central bank will control the new entity and loan it $54 billion. The crisis swept across the Middle East and Asia as well, with South Korea especially hard hit. China, which had been the world's major growth machine in recent years, seemed to slow down. In November China's government announced it would spend 4 trillion yuan ($586 billion) through the end of 2010 to stimulate its economy. It specifically targeted people's livelihood in an effort to offset the impact of slowing global demand for its exports and unlock the spending power of its vast population. Major financial institutions have teetered on the edge of collapse, and some have failed. As uncertainty has grown, many banks have restricted lending. Credit markets have frozen. And families and businesses have found it harder to borrow money....without immediate action by Congress, America could slip into a financial panic, and a distressing scenario would unfold: More banks could fail, including some in your community. The stock market would drop even more, which would reduce the value of your retirement account. The value of your home could plummet. Foreclosures would rise dramatically. And if you own a business or a farm, you would find it harder and more expensive to get credit. More businesses would close their doors, and millions of Americans could lose their jobs. Even if you have good credit history, it would be more difficult for you to get the loans you need to buy a car or send your children to college. And ultimately, our country could experience a long and painful recession. On September 19, 2008, the Treasury and Federal Reserve proposed a major rescue plan—the largest government intervention in the economy since World War II. The plan was for the Treasury to purchase $700 billion of the CDOs. The buyout was needed, Bush said, to avert a major disaster for the economy. Most (but not all) Democrats signed on to the plan, adding provisions for Congressional oversight and caps on CEO compensation; but at the last moment on Sept 25, 2008 House Republicans said no, and GOP presidential nominee John McCain held off endorsement. Conservatives were split on what to do. Many agreed with Bush that the program proposed by Treasury Secretary Henry M. Paulson was urgently needed. Large banks and corporations strongly endorsed the it. The American Bankers Association and the Mortgage Bankers Association are fighting against any amendment that would reduce mortgage obligations for people in bankruptcy, while directing all the government funds to the banking industry.The U.S. Chamber of Commerce, normally an outspoken advocate of big corporate interests, instead stressed the crisis's impact on small and midsize businesses. "We're looking at an economy that was slipping toward recession even before this crisis culminated in a market lockup last week," said Chamber economist Martin Regalia. The debate in Congress, he said, "is costing every American taxpayer money, directly." Democratic nominee Senator Barack Obama endorsed the plan, as amended by Congressional Democrats. On the other hand, ordinary taxpayers and "Main Street," that is businessmen who operated at the local level, were highly suspicious of Wall Street. McCain, blaming the crisis on "the corruption and manipulation of our home mortgage system," rejected the bailout as a favor for Wall Street and little help to Main Street. Advocates of the market economy insisted that the market should run its course, and opposed the government intervention. The fiscally irresponsible TARP program increased the national debt by $300 million in 2009. A compromise was agreed to by leaders of both parties but the "Emergency Economic Stabilization Act of 2008" (EESA) was voted down in the House on Sept. 29. Democrats favored the Bush bill 60%-40%, but Republicans voted no by 65-35%. The stock market lost a trillion dollars in value in one day as uncertainty reigned. Finally a large majority passed a more expensive bill, that added $100 billion in new subsidies to the original $700 billion, plus tax breaks and a rise in FDIC insurance to $250,000 from $100,000, intended to reassure ordinary depositors. Both Obama and McCain voted for this version of the bill. The Treasury TARP program proved erratic and had to be radically modified several times. The Treasury dropped the original plan to buy toxic securities and instead has used $250 billion to prop up major banks. In October Paulson and Bernanke used their new powers to take an ownership stake in the nine largest U.S. banks, of $7 to $25 billion each. These banks are now partly owned and controlled by the government. However those banks are keeping the money and not lending it out. The price of bank stocks has fallen sharply since the relief program was passed. The world's largest bank, Citigroup, was on the verge of collapse in late November and received a second loan of $20 billion (in addition to $25 billion in October), and a federal guarantee to cover most of its toxic investments. In mid-December Bush announced that $17.4 billion of TARP funds would be given to the automobile industry in the form of bridge loans, just enough to prevent the companies from going bankrupt for a few weeks. Bush defended the move by saying "if we were to allow the free market to take its course now, it would almost certainly lead to disorderly bankruptcy and liquidation for the automakers." By mid-November the market had lost confidence in Treasury Secretary Paulson, who indicated he was baffled and would let the incoming Obama administration handle the unspent $450 billion. The stock market jumped 6% on the news that Obama had picked New York banker Timothy Geithner to replace Paulson. In late November the Federal Reserve announced it will buy up to $600 billion in mortgage-related assets from Fannie Mae and Freddie Mac, hoping to restart the housing and credit markets. Under the new "Term Asset-Backed Securities Loan Facility," or TALF, the Federal Reserve will loan up to $200 billion to financial companies that hold securities backed by consumer and small-business loans. Hedge funds are private investment companies with a combined $1.7 trillion in assets. They have lost $180 billion since July and some are near collapse. Investors are demanding their money back, and Wall Street in late October is bracing for a shake-out in the industry. In late November the government announced an $800 billion plan to boost consumer credit and the market for mortgage-related securities. Plans call for the Federal Reserve in early 2009 to extend up to $200 billion in non-recourse loans to holders of asset-backed securities backed by highly rated consumer and small business loans. Treasury will contribute $20 billion in funds through its Troubled Asset Relief Program (TARP). The Federal Reserve also announced it will purchase up to $100 billion in GSE (government-sponsored enterprises, especially Fannie Mae and Freddy Mac) debt through a series of competitive auctions starting in December, 2008. The Federal Reserve starting in December will purchase up to $500 billion in mortgage-backed securities backed by GSEs such as Fannie Mae and Freddie Mac. Federal Reserve Chairman Ben Bernanke said the Fed is preparing to launch new liquidity programs to support the economy in addition to further slashing interests rates. The total commitments by the government in relief and loan guarantees exceeded $7 trillion, but the economy nevertheless continued to slip downward. By early December the entire economy was heading downward with no bright spots. The recession that began in Dec. 2007 intensified, as retail sales plunged. In November 2008 Americans, their confidence shaken, saved their money and sharply reduced their credit card purchases. Auto sales were down 37% in November (compared to Nov. 2007) to the lowest rate in 26 years. GM sales fell 41% Ford fell 31% and the foreign cars were down just as much, with Toyota down 34%, Nissan down 42% and Honda down 32%. Retailers rang up the lowest November sales in more than 30 years, as holiday shopping not only failed to lift the economy but showed that the crisis is further distressing everyday consumers. Thirty major companies—including Macy's, Sears, Abercrombie & Fitch and Target—posted sales declines; Wal-Mart, anchoring the bottom of the price chain, sawincreased sales. Retail sales in November fell 2.7 percent compared with the same month last year. The Federal Reserve reported on Dec. 3, 2008, that every region reported sales declines, drops in manufacturing activity, weakening real estate markets, tighter lending, and deteriorating labor marketsThose sectors that had been strong until recently—especially as agriculture and energy—also softened as commodity prices declined. November saw 533,000 jobs disappear in the worst one-month decline in 34 years. In 2011, it was revealed that the Federal Reserve secretly propped up elite bankers all the way from Wall Street to Brussels to the Central Bank of Libya. This was the Fed covertly operating its own bailout program. The names of those involved were revealed by Bloomberg News and it took several years of Freedom of Information Act court battles to unearth Fed actions. The Fed would have never revealed its secret bailout on its own. On Sept. 25, Washington Mutual, the 6th largest bank in the US with $310 billion in assets, went bankrupt after a run in which depositors withdrew $17 billion in a few days. Its stockholders lost all their money, the US government took it over (through the FDIC, which insures ordinary bank deposits), and resold it the same day to the biggest New York bank, JPMorgan Chase. It was the largest commercial bank failure in American history, by far. Meanwhile, the #4 U.S. bank, Wachovia, burdened by $120 billion in toxic securities, was bought out by Citigroup on Sept. 29 in a deal engineered by the FDIC. However Wachovia then broke its deal and merged into Wells Fargo. The result is that four major banks now dominate the American economy (Bank of America, Citibank, JPMorgan Chase, and Wells Fargo), along with dozens of regional chains and thousands of small local banks. Citigroup, the world's largest bank was tottering in late November despite its receipt of $25 billion in TARP funding. Its value on the stock market plunged to $21 billion, down from $244 billion two years ago. Round after round of layoffs have ended 75,000 jobs in 2008 out of 375,000 employees a year ago. Very heavy exposure to toxic mortgages is the main culprit. The government stepped in with the largest relief effort yet, including $20 billion in new cash, and guarantees of toxic assets by the Treasury, FDIC and Federal Reserve. At all times Citigroup used elaborate mathematical risk models that looked at mortgages in particular geographical areas, but never included the possibility of a national housing downturn, or the prospect that millions of mortgage holders would default on their mortgages. The prevailing approach at Citigroup and the other big banks was to make money as fast as possible (generating annual bonuses of $10 to $30 million for senior executives), which assigning zero to the risk of a system-wide downturn. Such a downturn came with disastrous consequences for Citigroup and its rivals on Wall Street. Even after Bear Stearns ran into serious trouble in summer 2007, Citigroup decided the possibility of trouble with its CDO's was so tiny (less than 1/100 of 1%) that they excluded them from their risk analysis. Despite two federal efforts Citigroup is still wobbly. It holds $20 billion of mortgage-linked securities that have been marked down to between 21 cents and 41 cents on the dollar. It has billions of dollars of giant buyout and corporate loans of dubious value. And it also faces a potential massive losses on auto, mortgage and credit card loans as the economy worsens. By the end of 2009 most big banks were in much better shape and the Treasury expects to recover all but $42 billion of the $370 billion it lent to ailing companies, with the portion lent to banks actually showing a slight profit. Meanwhile, over 120 small and medium banks have been shut as insolvent; in most cases the FDIC picks up the losses and another bank takes over the operations and branches. In 2008 a series of damaging blows drove the "Big Three" (GM, Ford and Chrysler) to the verge of bankruptcy. Part of the cause was very high labor costs (much higher than the foreign plants in the U.S.), and lack of consumer demand for their products. The Big Three had in recent years stressed expensive, fuel-guzzling SUVs and large pickups. They were much more profitable than smaller, fuel-efficient cars. When gasoline prices shot past $4 in 2008, Americans stopped buying the big cars, and the Big Three saw their sales plummet. The Financial Crisis played a role as no one was willing to loan GM the money to buy Chrysler. Consumer credit has tightened and it became much harder for people with average or poor credit to obtain a bank loan to buy a car, so sales fell further. Stock prices plummeted as shareholders worried about bankruptcy; GM's shares fell to 1946 levels. Intense debate ensued about a massive bailout, that would be in addition to a $25 billion loan Congress passed in September 2008 to assist in increasing fuel efficiency. President Bush proposed changing the terms of that loan so it could be used to cover daily operating expenses, but Congress rejected that. Republicans in Congress in mid-November blocked Democratic proposals to underwrite a new bailout of the auto industry, as industry leaders made an unconvincing case before Congress. President Obama and Democrats in Congress have demanded the Big Three come up with a highly specific plan with some chance of long-term viability. Critics claimed the proposals would lead to unnecessary job loss. In addition to the Big Three hundreds of large suppliers of parts are in financial crisis as well; most would go under if the Big Three go bankrupt. Intense debate in December 2008 focused on allowing bankruptcy or injecting billions more of federal aid; it would be in addition to a $25 billion loan Congress passed in September 2008 to assist in increasing fuel efficiency. The Democrats in Congress supported president Bush's proposal to use the fuel-efficiency loans to help with the immediate problem. It passed the House but Senate Republicans broke with Bush and it failed. The opponents called for a bankruptcy that would allow GM to get out of its contracts to pay union members high wages, as well as generous pensions and medical benefits to retired workers. Bush then acted unilaterally and decided to make TARP loans to GM and Chrysler, on December 19. GM and Chrysler will get $13.4 billions in loans they can use to pay their suppliers. GM can receive another $4 billion in February, but by then the Obama administration will be in charge, and it is emphasizing the need for a long-range solution. Bankruptcy of Chrysler and GM took place in the second quarter of 2009. Chrysler's sale to Italian automaker Fiat has been finalized. GM received billions more dollars to prevent bankruptcy but fell none-the-less. In addition, GM will require $30 billion in the first stage of bankruptcy. The Obama Administration is the single largest shareholder with the UAW second at 17% ownership. Also, many auto dealerships have been shuttered, thousands of workers have been laidoff, assembly plants closed, and product lines dissolved or sold. The Obama Administration, taking office on Jan. 20, 2009, moved to handle the crisis on two fronts. Working with Democrats in Congress (and three moderate Republican Senators), it passed the "American Recovery and Reinvestment Act of 2009," calling for $500 billion of new spending and nearly $300 billion in new tax cuts. The new law began operations in mid-February, 2009, and supporters hoped it would slow and turn around the nosediving economy. Conservative critics feared it would be ineffective in the short run and add to the national debt and tax burdens in the long run. As of late March no results are visible. With major banks on the verge of failure, Treasury Secretary Timothy Geithner unveiled yet another massive bailout program in mid-February. Trillions would be spent to move toxic assets out of the banks, but few details were provided. The widespread reaction was very negative, and Geithner lost more of his credibility as a problem solver. Geither finally came back with a plan on March 23 that will not need additional funding or approval by Congress. The Treasury will use $100 billion from the Troubled Asset Relief Program (TARP), as well as new capital from private investors, in order to generate $500 billion in purchasing power to buy toxic loans and assets. The program could potentially expand to $1 trillion over time. The nations banks now lend 25% less than when the financial bailout was announced. The USA relies on China to buy our U.S. Treasury bonds to fund the increased spending. America is a debtor nation, we spend more than we save. The dollars value has plummeted against world currencies. Gold prices remain at record levels.The money that we don't have, but spend, will be a debt that future generations will have to worry about. This has brought rise to the term 'Generational Theft' in describing Obama policies. In the view of 51 mostly conservative economists polled by the Wall Street Journal in July 2009, the Obama administration's performance is problematic. President Obama and Treasury Secretary Geithner both got an average grade of 70 out of 100 for their handling of the financial crisis, but those grades varied widely. Former President Bush and ex-Treasury chief Paulson got average grades of 50 and 60, respectively, when economists were asked how they handled the crisis while in office. By contrast, Fed chairman Bernanke scores much better, with an average grade of 85; in addition 93% of respondents said he should be reappointed by Obama when Bernanke's term expires early next year. John Samples, Lawless Policy:TARP as Congressional Failure, Policy Analysis No. 660, CATO Institute, February 4, 2010. Great Depression Quotes 1929 vs 2008: Have We Learned Anything? ↑ NBER is a private organization that follows its own standards as set by eminent economists such as Milton Friedman; its dating of business cycles is widely accepted by conservatives. ↑ The only money the speculators had at risk was a down payment; sometimes the construction company paid for the down payment and closing costs, so the risk to the speculator was zero. Mortgages in the U.S. are "non-recourse" which means that borrowers cannot be sued for stopping payments. ↑ That is, homeowners were obligated to pay the debts and the collateral behind them was the physical house. ↑ Commercial real estate lending is more specialized than Fannie Mae lending, as much commercial property tend to be one-of-kind investments; finding comparable properties to establish appraisal value can be very difficult and complicated. Hence, commercial rates tend to begin at 10% for the best credit customers with much shorter terms and balloon payments. ↑ or, the borrowers to default when interest rates rose on Adjustable Rate Mortgages. ↑ The short sellers did not own the shares; the practice was stopped on Sept. 19, 2008, by the Securities and Exchange Commission because it destabilized markets. ↑ "Financial crisis: HBOS and RBS 'to be nationalised' in £50 billion state intervention," London Telegraph Oct 13, 2008 The existing stockholders were not bought out. They will continue to hold shares in the banks, but they will be outvoted by the new stock owned by the government. ↑ "Non-recourse" loans means that if they are not paid back the borrowers cannot be sued for their other assets. Mortgages fall in this category, so that if people default they just walk away from the debt and never have to repay it. However it damages their credit rating. ↑ Stephanie Rosenbloom, "In November, Shoppers Cut Spending Even More," New York Times Dec. 2, 2008; Nick Bunkley, "Another Month of Miserable Auto Sales," New York Times Dec. 2, 2008. ↑ In the Great Depression, only one major bank failed (New York's Bank of United States, in late 1930), although over 6000 small neighborhood and rural banks went under; depositors eventually received on average 85% of their deposits. ↑ GM and Chrysler will receive $4 billion each when they sign the loan agreements with the Treasury. GM will have access to an addition $5.4 billion on Jan. 16 and another $4 billion on Feb. 17 provided that Congress has released the remaining $350 billion for the Treasury’s TARP rescue program. This page was last modified on 9 April 2019, at 08:49. This page has been accessed 232,942 times.